Karl Robinson said he felt numb as his side secured promotion to the Championship on Sunday. 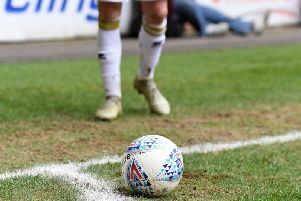 Dons were 5-1 winners at stadium:mk against Yeovil, but it was the 1-0 defeat for Preston away at Colchester which made it all possible as Robinson’s men leap-frogged the Lily Whites into second, with it snatching automatic promotion. “I don’t know how I feel,” said the Dons boss afterwards. “I feel numb. To achieve the goal we set out to achieve is remarkable. “It’ll live with us forever. I’m so proud of the players. They gave their all for every minute of the season. “It’s amazing, we’re never going to forget this. We want to take it all in. I don’t want to wake up tomorrow and wonder if it’s all a dream. With his side 4-0 up at half time, thanks to goals from Carl Baker, Dean Lewington, Darren Potter and Will Grigg, Dons had their end of the bargain wrapped up but knew they’d need a favour from Colchester against Preston. Chris Porter’s penalty miss had Dons fans in raptures, then in the dumps in a matter of seconds. But George Moncur’s decisive winner 10 minutes from time not only ensured the U’s would remain in League 1 for another season, but allowed Dons safe passage behind Bristol City into the Championship. Robinson said: “I was trying to be cool and calm, but by the end I was crumbling! It helped their game ended before ours. When we knew it was over and we still had a minute to play, it was the best minute I’ve ever watched. “Once we realised they’d missed it, there was a lull. But then we heard they’d scored. It ebbed and flowed all afternoon. “When we got beaten by Preston here - our last loss - we didn’t know where we were going. To go to Walsall and get a point like we did, and get nine wins in 11 is sensational.